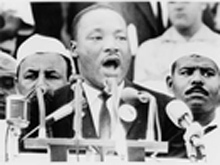 Dr. Martin Luther King, Jr. is speaking at Washington about the Speech,"I Have A Dream". Dr. King was a man that had a dream, he was born on January 15th, 1929 and he died on April 4th, 1968. Dr. King was a Civil Rights Leader, who wanted to stop segregation, discrimination, or the desire of no integrating the races, he believed that we were all equal in the sight of the Lord and I believe that we are apart of a greater purpose. Dr. King was a great speaker, a peaceful warrior, a spellbinding orator, a peacemaker, and he was sensitive to the needs of his people. Dr. King was a man, who believed that he saw this dream that he read in his speech, how one day, the nation will rise up, how one day, his four children will not be judged by their color, but by the content of their character.